We ate a lot of sweet corn in this season and also corn being one of Anaya’s favorites we used to get it regularly. 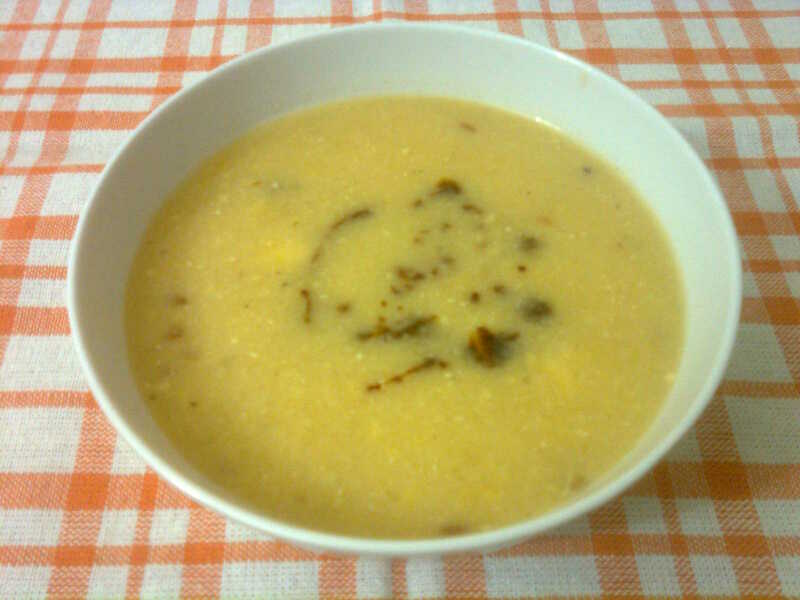 I tried this soup long back and it turned out delicious and creamy. In the above picture I just drizzled some soya sauce over it but it’s optional. You can also add oregano and chili flakes if you like. Combine together onion, tomatoes, green chili, coriander leaves and water in a big vessel and allow it to boil for approx. 10 to 15 minutes. Strain the stock and keep aside. In the same cooked onion tomato mixture, put some water and blend it. Strain the juice and mix it with the above stock and keep aside. Blend the boiled corn to a very smooth puree. Before grinding reserve some corn kernels aside to put in the soup later. Heat some ghee or butter in a pan and crackle cumin seeds and fry the ginger garlic paste. Add the corn puree to this and fry for 2 minutes. Mix in the stock, pepper powder, salt and the corn that is kept aside before grinding. Allow the soup to boil for a while. Adjust salt and pepper. Serve hot. Posted on October 14, 2012 by Varsha	• This entry was posted in Soups, Uncategorized. Bookmark the permalink.